Marriage is the most important social, as well as religious, event in Indian culture. Indian weddings are known for their grandeur and elaborate nature. Most weddings in India last from 3-5 days, full of fun, frolic, numerous rituals, plentiful of delicious foods, and lots of music and partying. As I mentioned in the previous post, there are pre-wedding, wedding, and post-wedding celebrations. These are some of the Pre-Wedding ceremonies from an Assamese Hindu Wedding. The Mehendi function is usually organized with the sangeet function. So, it has a festive feel to it with the women dancing and singing traditional songs on the mehendi ritual. The bride is dressed in light color clothes with light jewelry. According to the custom the bride must not step out of the house after the mehendi ritual until the wedding day which is usually after two days. It is believed that the darker and deeper the henna stains,the more the husband and the in-laws will love the bride. The ritual of mehendi signifies the strength and power of love in a marriage, so it is regarded good presage for the would-be bride. It is said that the longer the bride retains the mehendi, the more auspicious would be her future. It is also customary for the bride not to be allowed to do any housework after the wedding, until her Mehendi wears off. This ceremony is considered very vogue, and it takes place after the Mehendi Ceremony. It revolves around the bride and groom, their love story, how they met, fell in love, etc. It involves family and friends of the bride and groom, who throughout the night perform many choreographed dances, sing ritual wedding songs, and enjoy a myriad of foods and drinks. This ceremony takes place a day or so before the wedding. 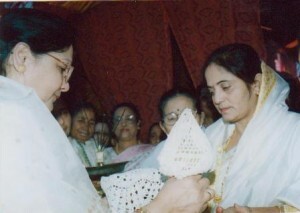 This is an Assamese ceremony that takes place in the bride’s home. The groom is not allowed to attend this ceremony. Several women and few men from the groom’s family arrive at the bride’s home and the mother of the bride greets the mother of the groom. The bride’s mother leads the groom’s mother to the morol, which is a decorated small mandap (wedding area), made of banana or mango leaves and flowers. The bride is brought in and sits in front of a morol while the groom’s mother as well as other women from the groom’s family presents the bride with gifts. The groom’s mother also puts sindoor (holy vermillion) on the bride’s forehead during this time. After the Juroon, the bride’s mother and women from the bride’s family will leave for a nearby lake to collect some water which is treated as holy water. This ceremony is called Panitula (ceremonial bath). The bride’s mother will bring back the holy water from the lake. The bride’s mother and relatives will then apply turmeric and yogurt on the bride and groom at their respective homes and bathe them with water. Though the bride’s mother is the only one who will be collecting the water in a vessel, she is accompanied by other women who are singing traditional songs. The bride doesn’t attend this ceremony and instead waits for the women to return back to her home for the next ceremony. The Haldi (turmeric) ceremony takes place next at the bride’s home. The bride will be seated on a small stool, while her body is anointed with turmeric, sandalwood paste and oils. Their purpose is to cleanse the body, soften the skin, and make it aromatic. The holy water that was collected by the bride’s mother is also used. All the women from the bride’s family as well as her female friends take part in this ceremony. 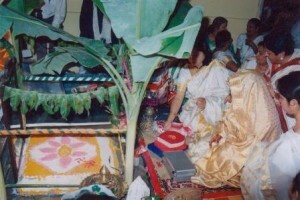 The women also throw rice on the bride as a sign of prosperity. The significance of this ceremony is that in ancient times, when there was no make-up, this ceremony acted as a beauty enhancer. sorry leave a wrong url. must say i really appreciate your efforts. i have posted this on my facebook. have a look. Thank you very much, I really appreciate that. I totally enjoyed learning about all the different rituals and traditions. I could not believe that the marriage ceremony takes almost a whole work day….but during night time. its look like in movie…. My information is based on my interview with a couple from India who shared many of their own pictures from their wedding. I am hoping that some day I will have the pleasure to attend one of these kind of weddings. It does sound very religious and ceremonious, which is really cool.